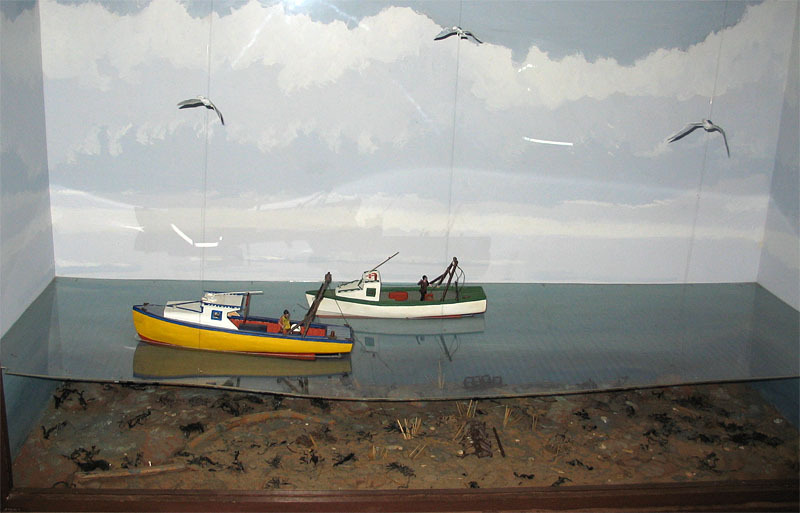 Fishing boats at anchor, and fisherman at rest, at the Basin Head Fisheries Museum. Working at the Manitoba Museum, I have been fortunate to work with some superb artists, and to observe them closely as they prepare dioramas and other artistic exhibit materials. I recognize that dioramas such as ours require extremely advanced artistic skills combined with thousands of hours of research, preparation, and execution. Those of us who develop exhibits of course tend to view the work shown at other institutions with a critical eye. 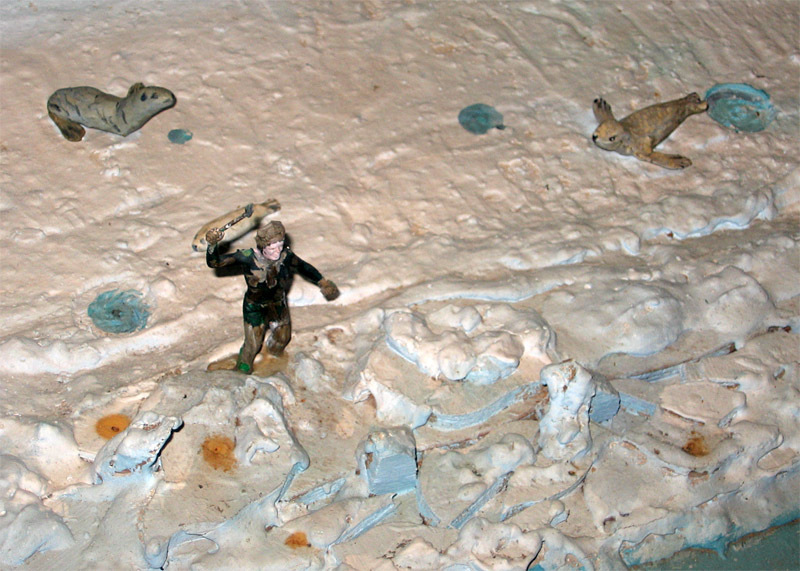 Some dioramas in other museums are not really quite “there,” while others, such as those at the American Museum of Natural History have justly earned their reputation as lasting pieces of art. 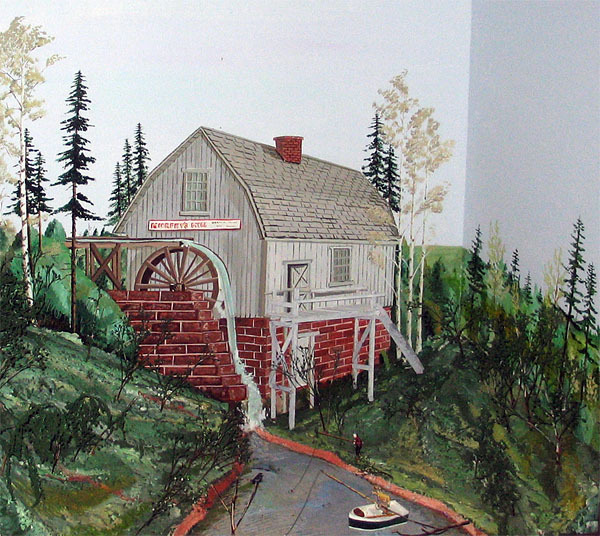 This beautiful mill at Basin Head might have almost stepped out of a Maud Lewis painting. Knowing what it takes to produce professional dioramas, I am often surprised and sometimes impressed by the work of those who leap into it from the other end of the artistic spectrum: the self-trained artists who are determined to produce three-dimensional representations of life. 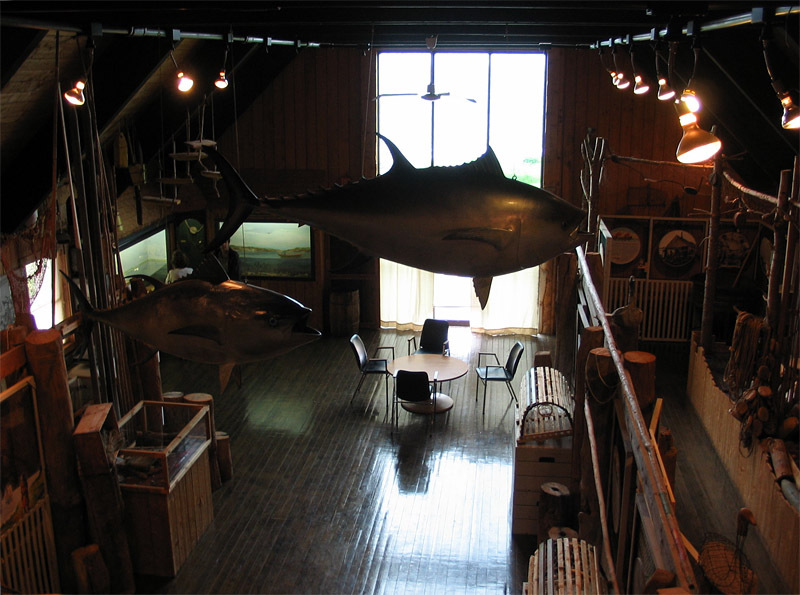 As these mini-dioramas from the Basin Head Fisheries Museum show, such work can be beautiful, charming, and artistically successful. The main objective of many of these dioramas is to depict work life as it is or was. 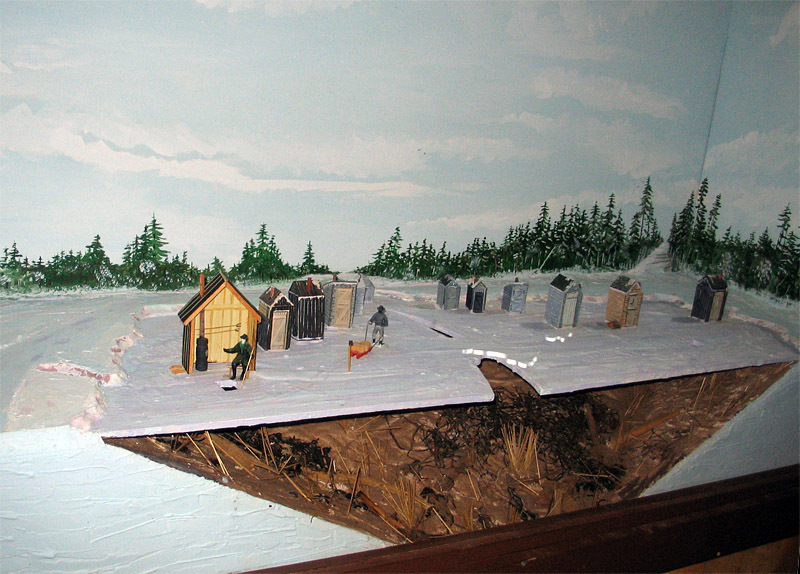 This detailed ice-fishing model shows activity both above and below the water. These dioramas succeed, not in spite of their blithe disregard for some of the standard rules of diorama composition, but perhaps because of this disregard. They substitute exuberance for the laws of perspective and first-hand knowledge for detailed academic research; a desire to represent every aspect of coastal life overwhelms any attempts to trim or edit. In each detail they demonstrate their maker’s love for and understanding of the subject being presented. As this sealing scene shows, the dioramas pull few punches when it comes to showing the details of life! 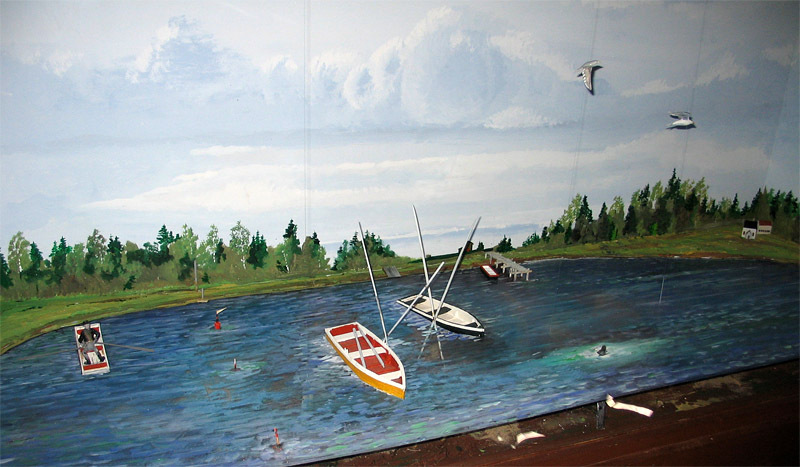 These dioramas are really works of folk art, three-dimensional equivalents to the paintings of Maud Lewis or Grandma Moses. In some instances they depict aspects of life gone by, in other places they show life on the land and sea as it still is. In each case they pull few punches: seals are slaughtered with axes, schooners are sunk, and fishermen relax by … going fishing, of course! Two schooners, one above and one below the water. Those are really lovely examples. I particularly like the ice fishing scene. They have a directness and honesty you just don’t find in most museum dioramas. In some ways, they’re really not so different from the tiny ‘prehistoric people’ dioramas they used to have at the ROM. I always liked the miniscule overview of life as it was, even if they were naive compared to their much flashier, life-sized brethren. Thanks Maya. We are lucky that we still have a few minis here, such as Betsy’s superb Algonkian encampment (which is a very big mini-diorama). Yes, the way they capture a scene is really valuable. I saw some great fishing mini-dioramas at a museum in coastal Japan that will have been wrecked by the tsunami; I will try to scan those photos some time! Great post, Graham. You’re right, passion put into do-it-yourself projects like this really evident, and it transcends any technical shortcomings. Sometimes I find myself more drawn to raw, visceral labours of love than to more polished and professional works. You are right, Sean. 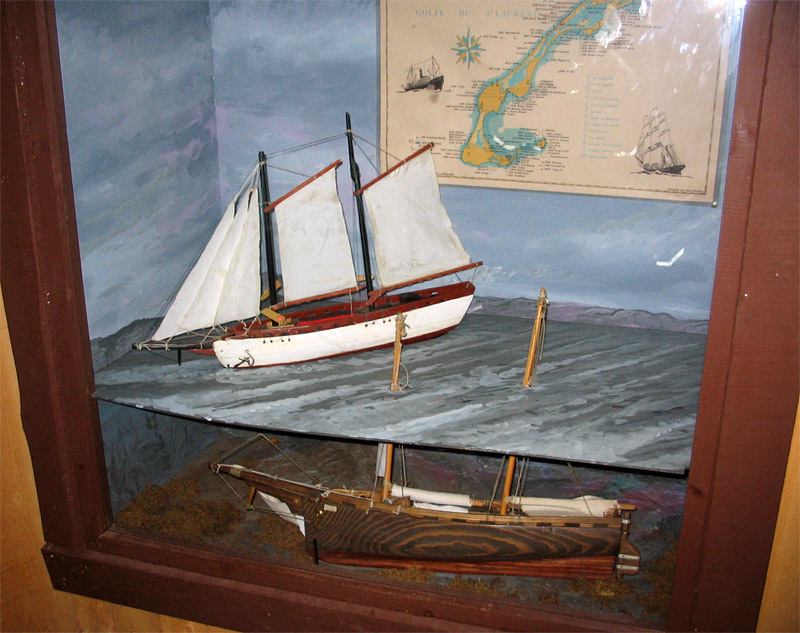 It is sort of equivalent to basic three-chord folk music, as opposed to the symphonic work of professional dioramas – both have their place. Graham, these are charming. They have a bit of history themselves it seems. Do you know when they were made? Karen, I’m sure there must have been signage indicating who made them and when, but unfortunately I didn’t photograph it (I shot those about four years back). And that museum has very little web presence, so I was not able to find more detail; perhaps it is buried somewhere on the internet! Thanks for the wonderful photos. I’m not a museum professional but rather a fan, especially of the older styles. It may well be nostalgia in part — I loved going to our local museum (natural history) as a kid, and there were lots of dioramas. Thank you for that, Hollis. Perhaps nostalgia plays a strong role, but I think some dioramas can have a strong effect even on the young who are used to electronic media.